Just Say NO to TEDx Columbus. I'm thankful for all the speakers who have said yes to TEDx Columbus for the past 5 years. I could never say no to going to TEDx Columbus. I’ve been to each and every TEDx Columbus… all five events. What if TEDx Columbus presenters said “no”? *That sentence is is an actual quote… The quote is not about TEDx Columbus, I don’t know at which TEDx event around the world the person who wrote that sentence was asked to speak. People do say no to talking at TED events, I am sure. Too busy. Too many commitments. 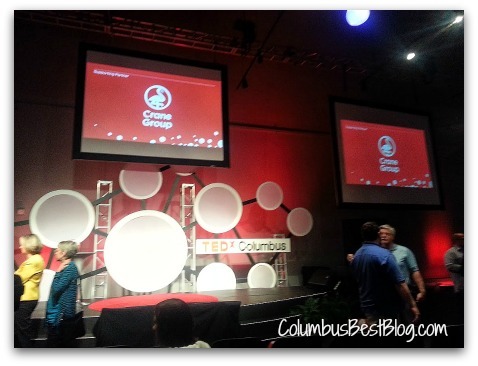 Talking at TEDx Columbus …. or any TEDx event has to be a huge commitment of time. TEDx Columbus has had some great speakers and performers share their “Ideas worth spreading” over the years. I just want to say thanks to all of them. Should TEDx Columbus speakers be paid? I for one am glad Susan Willeke, Mark Berman, Teresa Flores did not say “NO” to speaking at TEDx Columbus in 2011. What if my favorite speaker in 2009 Chrystie Hill who talked about Community; It’s The New Content said “no” when asked to speak? I was already hooked on watching TED Talks online before I heard in 2009 that there was going to be a TEDx Columbus. My favorite TEDx Columbus year was 2010. What if Michael Wilkos had said no to speaking in 2010? TED is a non profit. There was a little local scandal in 2009 before the first TEDx Columbus. The little local TEDx scandal was partially about money. The local TEDx scandal was not about asking people to speak for free at a TEDx event. The little local TEDx scandal was about how expensive the tickets to TEDx Columbus 2009 were. $50. You can find traces of the little local TEDx scandal online still if you know where to look… what to look for. Some of the 2009 local TEDx scandal posts and tweets are gone. There are links that lead to dead ends. Some of the 2009 posts about the little local TEDx scandal have been taken down. Perhaps it was embarrassing when TEDx Columbus 2009 came off so well. The local TEDx scandal was about more than the ticket price but it is hard five years later to understand. Cronyism? Who would make money from TEDx Columbus? If they were doing it right? The little local TEDx scandal helped me understand the difference between TED and TEDx events. The original TED event is much, much more expensive to attend, than the local TEDx events. The BIG event in California costs big bucks to attend. $6,000? I can not even imagine. TEDx Columbus was October 11, 2013, I went. My fifth. Thank GOD Michelle Alexander, Mohamed Ali, Josh Hara, etc. did not think like Frank Swain. They said yes. Does Twitter pay Swain for his tweets? The bio on his site says: “Frank Swain writes and talks about science.” Does Medium.com (the site with the post ‘Why I’m Not a TEDx Speaker‘ pay writers? Medium bills itself as “A better place to read and write.” Medium.com is a publishing platform founded by Evan Williams, one of the founders of Twitter. Medium.com does not look as if the writers publishing are paid. Not that it matters if Mr. Swain wants to give it away for free to Medium.com but does not want to give it away for free to TED or TEDx… that’s his business. Swain talks in his post about where he has spoken for free, but you will not find him talking at the TEDx event that asked him to speak. Could there be a commercial TED like event? Would it reach the proportions that TED has? Swain raised some interesting points in his Medium.com post ‘Why I’m Not a TEDx Speaker.’ Swain’s criticism of TED is not just about getting paid. Swain however, lost me when he used $6000 as the cost of a ticket to the TEDx event in his post. How much do tickets to TEDx cost? Frank Swain is a freelance science writer and speaker. In Europe? Sounds like he is in Europe. His post on Medium.com uses the $6000 cost of a ticket to the big TED event in California to explain why he said “no to TEDx.” Do TEDx tickets anywhere cost $6000? That would be steep. That would be an exclusive event. I wonder how much TEDx talks in other parts of the state cost…or in bigger cities not that it matters. The 2011 price for TEDx London (just guessing here, I really don’t know which TEDx local event asked Swain to speak… which allowed him to say‘ Why I’m Not a TEDx Speaker’ ) I found something online about a “£65.00 price tag” for TEDx London. London in the UK not the London west of Columbus but you knew that, you are smart. If I am not mistaken that converts to $87.7666 US… Swain using the $6000 price of a ticket in his post was misleading.TEDx Columbus tickets cost $50 in 2009. In 2013 a TEDx Columbus tickets cost $100. Worth every penny. Thanks to all the TEDx Columbus speakers for not saying NO to TEDx Columbus.